Live events are inherently social, says CEO Nathan Hubbard. Buying tickets should be, too. When Ticketmaster CEO Nathan Hubbard and his new executive team hit the road earlier this year touting a more innovative and fan-focused company — the Turnaround Tour, we dubbed it in the July/August issue — one stat was a guaranteed show-stopper. Each time a ticket buyer shared with Facebook friends that he was attending an event, Hubbard said, that alert generated $5.30 in additional ticket revenue. Starting today, you can see what the fuss was about. In hopes of spurring word-of-mouth marketing to reduce the estimated 40 percent of live event tickets that go unsold, Ticketmaster is launching this enhanced Facebook connectivity. The feature is available on the interactive seat map that launched last year and is now used in more than 300 venues (for 9,000 events and counting), says Debbie Hsu, Ticketmaster’s director of product management. Fans choose their exact seats instead of relying on Ticketmaster to determine the “best available” options. That’s the sort of control consumers expect of a top-five e-commerce site like Ticketmaster, but it wasn’t a priority in previous years when the company was focused on serving the venues. Now you can have an even more customized ticket search. 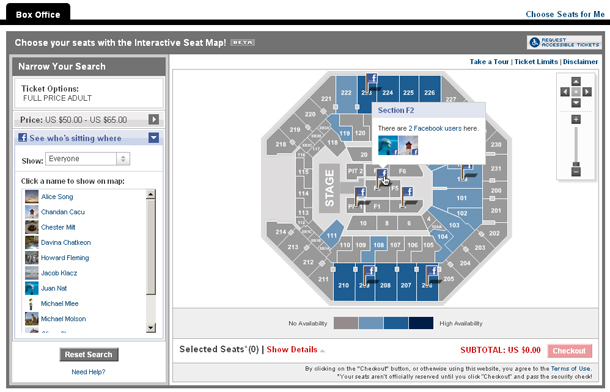 By connecting to Facebook while you browse for seats, you can see where your friends have purchased tickets. The friends who have tagged their seats, that is. Once you’ve connected to Facebook from Ticketmaster’s site, a list of friends who are attending the concert or game appears on the left. The venue’s seat map displays Facebook flags in the sections where your buddies are sitting. When you click on that section and scroll over a seat with a Facebook icon, a window pops open showing you who’s there. That way you can buy tickets near a friend, or head for the opposite side of the arena to avoid an ex or that certain colleague you know will belt along with the band and ruin the show. After buying your tickets, you have the option of tagging friends for the seats you’ve purchased, much like tagging people in a photo on Facebook. Your friends get an alert asking if they want to tell people they’re going and to tag their seat and share that as well, creating more potential ticket sales. You can hide your seat, but the default setting is to share with everyone, not just your friends. The thinking, says Hubbard, is that people going to see a certain band or team have a shared passion. Why not enable them to connect before the concert? Sharing your seat tag generates a “Check out my seats” post on your Facebook wall. Along with the “like” and “comment” buttons is “buy tickets,” the critical and convenient commerce part of social commerce. Earlier this month, Facebook games director Sean Ryan talked about the maturity of the games platform and suggested that live event ticketing could be the next big thing. Clearly, Facebook, which advised Ticketmaster during the development of the seat tagging, would like to find another Zynga-like success. “This isn’t just about social,” Hubbard says of the seat tagging. “It’s about the fan experience.” He wants a ticket to represent much more than access to an event. It should be part of a bigger experience that encompasses weeks or months of anticipation to see a favorite band and then a period of reliving the show with other fans. The ticket enables those connections. That’s why the seat maps will eventually be available after the event (that functionality isn’t available at launch). People reluctant to tag their seats might do so after the show and reach out to people they met at the show. Follow Chuck on Twitter at @chucksalter.